After practicing urgent care in the office setting for over 20 years, I realized that a lot of what I was doing could also be done outside the office – in a patient’s home, workplace, or elsewhere. Being mobile could help save people the burden of getting to a medical office when they are feeling ill or in pain. I enjoy going over to the homes of neighbors and friends to help them with their acute medical issues, often saving them a trip to the emergency room. So I thought, why not create a practice that consists of doing just that? Also, in most cases, when a patient goes to an urgent care facility for treatment, they are unaware of the identity of the provider who will be caring for them, or even whether they will be seeing a physician. When you call Boulder Mobile Acute Care, you will be speaking directly with the provider who will be seeing you, which is a rarity in most medical practices. 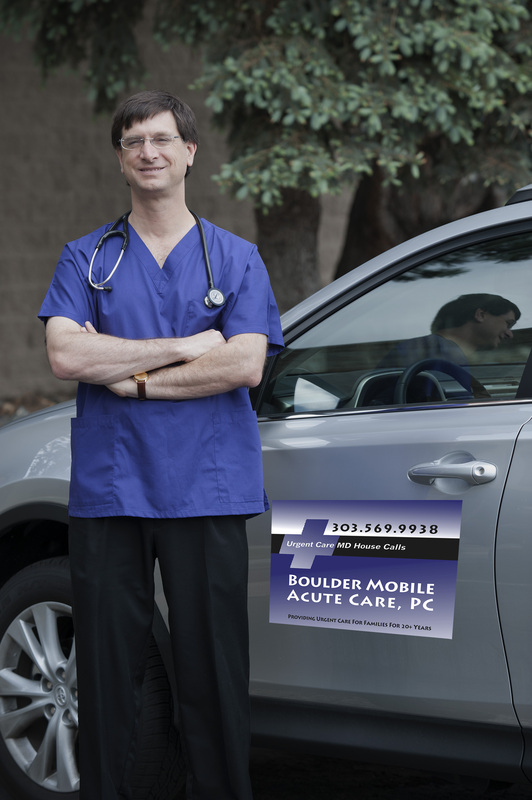 Boulder Mobile Acute Care’s purpose is to provide mobile treatment of non-life-threatening acute illness and injury. I am limiting my practice to Boulder and the immediate surrounding area, so that I can spend more time with you and get to you more quickly. I moved to Boulder from New York State in 1991 and worked as an Urgent Care MD for the Longmont Clinic from 1991-2010 and occasionally still work for them when they need coverage, as well as for the Carbon Valley Medical Center. I am board certified in Family Practice and currently a member of the American Academy of Family Physicians, the Colorado Academy of Family Physicians, the Colorado Medical Society and the Boulder County Medical Society. I live in the community of Boulder with my wife and our three sons. I take cash, checks and major credit cards. I do not accept insurance payment but I’m happy to help fill out whatever forms are necessary to assist you with reimbursement from your insurer. At this time I’m unable to see Medicare or Medicaid patients. Although BMAC does not provide continuing primary care, I can help direct you to a local primary provider or specialist.